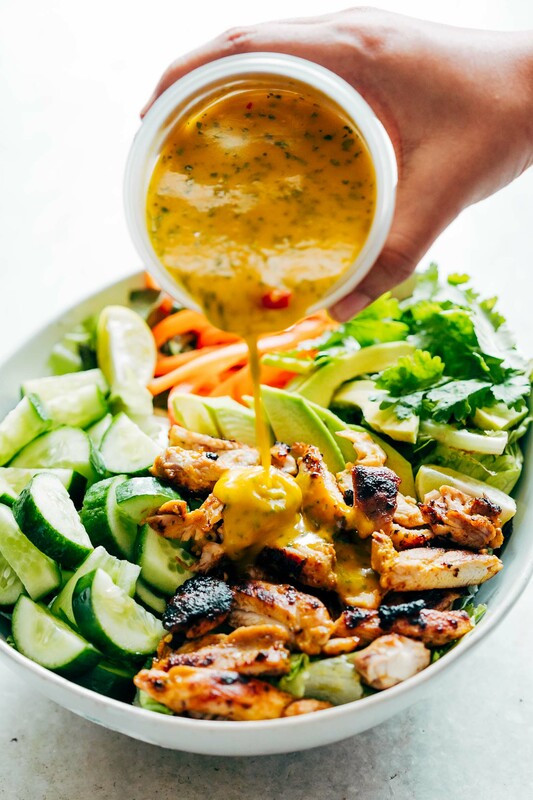 Grilled Chicken Mango Salad with Mango Cilantro Dressing is loaded with cucumbers, peppers, avocado and has a crazy good dressing that doubles up as a marinade! Best summer salad ever! Okay seriously I’m all about the salads right now, so you know you are going to be bombarded with salad recipes. Don’t say I didn’t warn you. But I need all the salads I can eat. Because we are going on a holiday next month, and I can do with clothes that actually fit me. And this grilled chicken mango salad with an ahhmaaazing salad dressing is just the thing to keep me going. Because it’s not a lightweight, this salad. It’s packed with so much that you are literally full halfway through the meal. But it doesn’t keep you feeling heavy either, which is what I hate about big meals. They should keep you feeling full but still, let you feel like you haven’t overeaten. These days I’m putting mango on everything because mango season is almost about to say goodbye. And I’m the saddest person because of it. 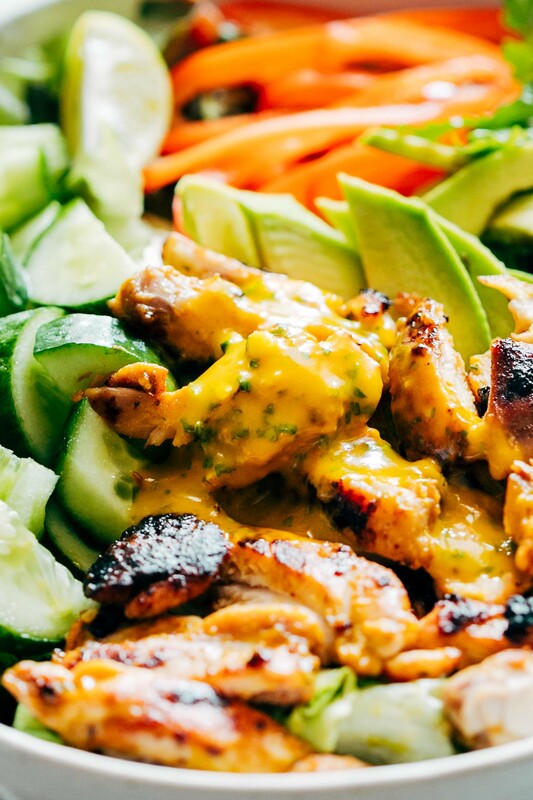 But we still have some grilled chicken mango salad to keep us company. So let’s enjoy it while we can. Tell me that you think using the mango cilantro dressing as a marinade also is a brilliant idea. You have to agree because that chicken has a gorgeous grilled chicken style crispy crust, and a mellow mango flavour thats there but not overpoweringly there. It teases. And we love it! Also I have to tell you that I haven’t tested this salad over and over again, because it’s one of those, add what you want kinds. If you are a vegetarian, go ahead and use grilled vegetables instead of chicken. Or skip out the peppers if you are not a fan. But don’t forget that dressing, and avocados and cucumbers and lettuce. Because those things are good for you, and I want you to eat the healthy stuff too. But now I’ve made this salad so many times since the last week that I don’t really look at a recipe. I add the veggies I like, toss it up in that dressing with chicken and even prawns sometimes for the best grilled chicken mango salad ever! Thank me later! Start by marinating the chicken in half a cup of mango cilantro salad dressing. Set aside for 15 minutes. Add olive oil to a grill pan, and cook the chicken for 15 minutes, turning halfway. Let it rest for 5-10 minutes before slicing. 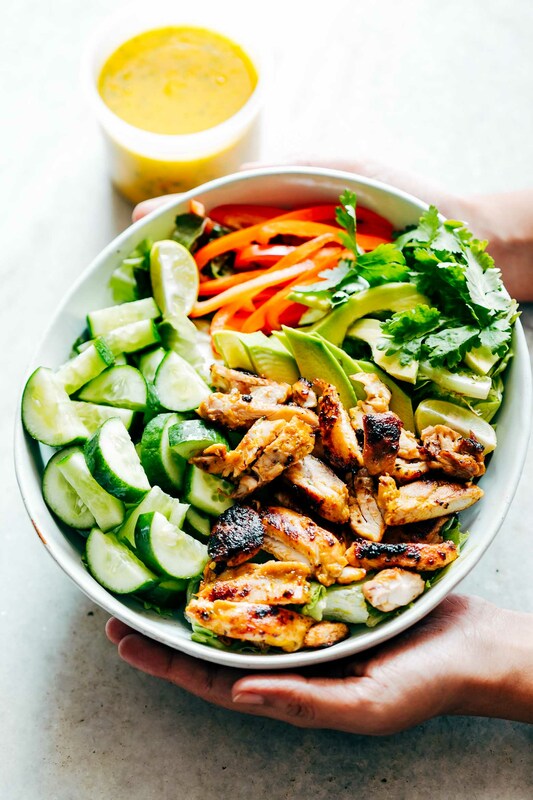 To assemble the salad, add lettuce, cucumbers, bell peppers, avocado, cilantro and grilled chicken to a large bowl. Pour the dressing on top and toss to combine. Serve immediately or the salad will get soggy.